Before beginning this article I should probably provide some insight into the types of issues raised to me by coaches that provoked me to write it. 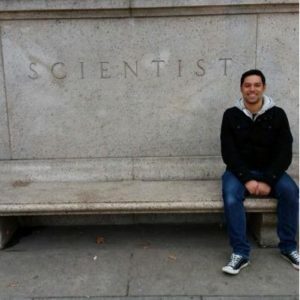 If any of this resonates with your experiences working with athletes I hope the following article will be of some use to you. The quality of the coach-athlete relationship in sporting contexts has been shown to be of vital importance to the success and well-being of an athlete (Jowett & Cockerill, 2002; Lyle, 1999). As a result, particular attention is paid to the ways in which the coach-athlete relationship can be enhanced so to manage the various challenges faced by what is often an intense and pressurised relationship (particularly in high performance sport where there are consequences for insufficient achievement). The most effective coach-athlete relationships have been shown to involve characteristics such as empathic understanding, honesty, support, liking, acceptance, responsiveness, friendliness, cooperation, caring, respect and positive regard (Jowett & Cockerill, 2003; Jowett & Meek, 2000). Of paramount importance to any relationship is trust; particularly relating to the trust each member has in the other’s ability to meet their needs. Coaches seeking to enhance the quality of the relationships they have with their athletes may benefit from developing an understanding of how their athletes’ perceive trust in their relationships. A tried and tested theory from mainstream psychology known as ‘Attachment Theory’ may provide a useful framework to achieve this. offer advice for building relationships with challenging attachment styles. 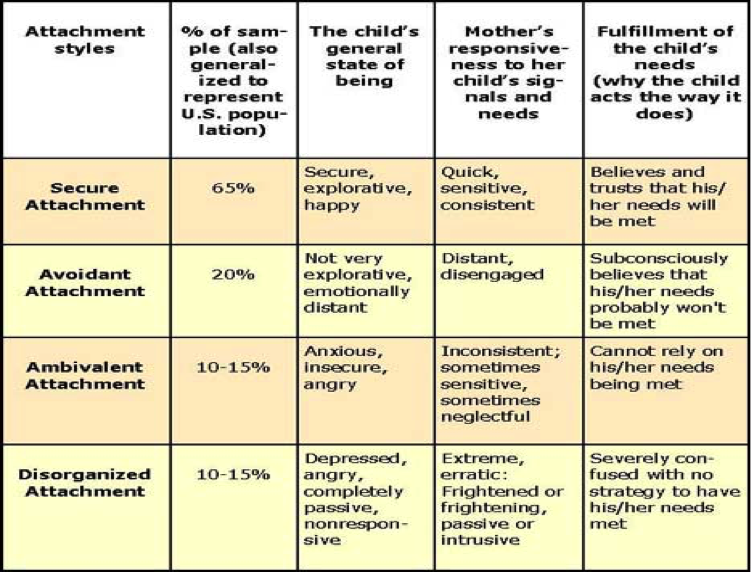 Table 1: Information on the frequency, child state, caregiver behaviour, and child perception of need fulfilment for each of the four attachment styles. Figure 1 provides a useful demonstration of the consequences of the caregiver’s behaviour. 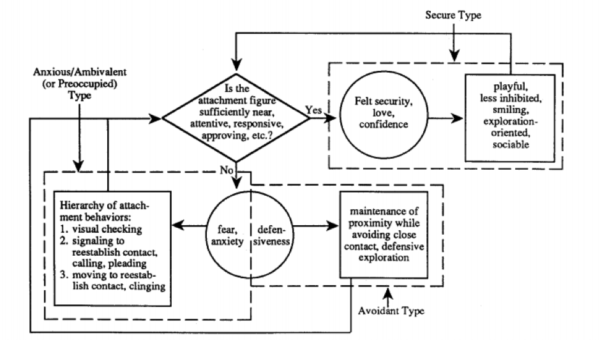 It can be seen from this diagram how caregiver behaviour can influence the development of three primary attachment styles. Figure 1. A flow diagram portraying the development of each of the three primary attachment styles. Now a question you may be asking is “What has this got to do with the coach-athlete relationship?” A good question, and one that can be answered by first of all acknowledging that the attachment styles we develop as infants have been reliably shown to direct how we develop relationships as adults (Brennan, Clark, & Shaver, 1998). Table 2. Examples of how attachment styles developed in infancy can manifest themselves in adult characteristics. From our early attachment experience we are left with an influential perception of ourselves and others in relationship contexts. These are referred to as our ‘Internal Working Model of Self’ and our ‘Internal Working Model of Others’. 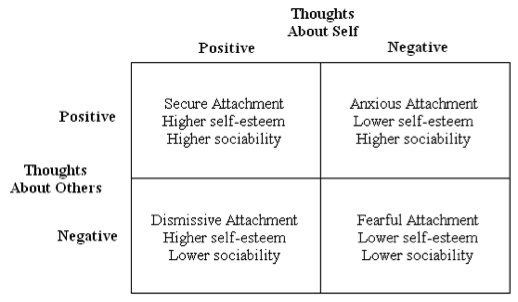 For ease of understanding, we can consider ourselves to have thoughts about ‘self’ and ‘others’ that are either positive or negative (Table 2). Table 2. Adult attachment style and the reflective positive or negative perceptions of self and others. A secure adult attachment style will consist of a positive view of self and of others. The securely attached athlete will have higher levels of self-esteem because they consider themselves worthy and capable of love and care. Given their positive attachment experiences, they also see others to be responsive and able to meet their needs. As they are better able to make secure attachments, they are likely to have higher sociability. An anxious-ambivalent (or sometimes called a preoccupied) adult attachment style involves the athlete having a positive view of others but a negative view of self. Their high regard for others as capable of offering care and support conflicts with their perception that they are not worthy to receive it. These individuals have low self-esteem and as a result are typically in a heightened state of anxiety about their relationships. They may seek regular reassurance that they are cared for/valued as their sense of self-worth is largely dependent on others. A dismissive-avoidant adult attachment style typically involves an overt positive view of self and a negative view of others. These individuals have learnt that they can meet their needs independent of external support and have likely never experienced a truly open and mutually beneficial emotional relationship. They are likely to dismiss emotions and personal distress as well as actively avoiding close relationships. A fearful-disorganised adult attachment style is rare and is beyond the scope of this article to discuss. 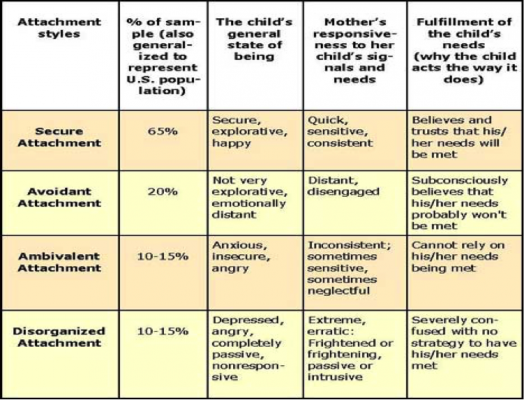 The table below outlines some observable behaviours and things to consider with the two more challenging attachment styles; Preoccupied or Anxious-Ambivalent and Dismissive – Avoidant. In conclusion, it can be seen that awareness of an athletes attachment style may provide coaches and support staff with the knowledge needed to adapt their communication style in order to gain ‘buy in’ and trust from their athletes. This is imperative for the creation, development and maintenance of an effective coach athlete relationship. 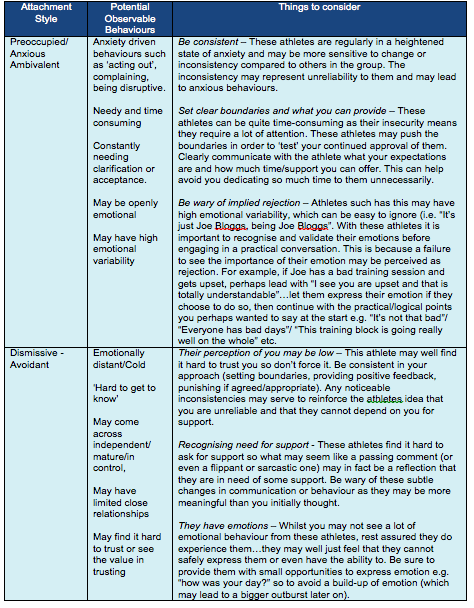 Awareness of attachment style and appropriate behaviour modification from the coach can provide opportunities for more challenging athletes to be handled more efficiently and in a more informed manner.